VR isn’t just a niche of console or PC gaming; it represents a quantum leap in digital communications and experiences, argues Simon Spaull, managing director, EMEA, at AppLovin. 2016 was a watershed moment for VR as it truly entered the public consciousness, with significant ramifications for the global ad industry. 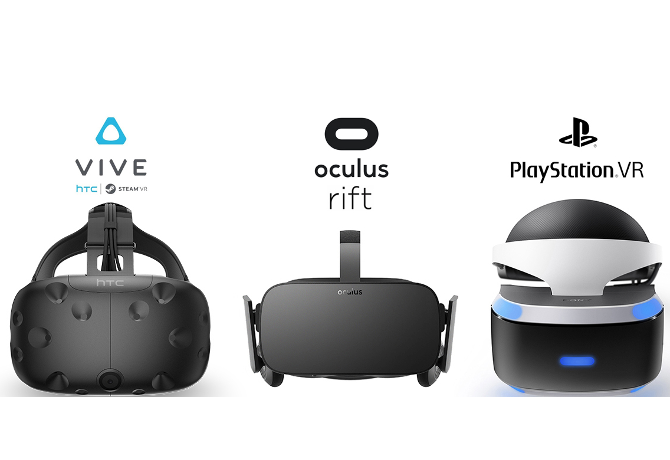 With the arrival of new consumer hardware from three competing platforms – Oculus Rift from Facebook, HTC’s Vive and, most recently, PlayStation VR – we can be confident that consumer interest for VR will continue to grow. Juniper Research forecasts that the VR hardware market will be worth $50bn by 2021 – that’s a projected 10-fold jump in five years. As VR takes off, it will undoubtedly evolve and transform not just advertising, but how consumers experience marketing overall. The user experience with ads is likely to become seamless in a whole new way once users are fully immersed in branded content. And because VR is so engaging and emotional, consumers are likely to make more purchases across digital platforms. Brands could even tease products and services in VR before embarking on a full release or launch for consumers in real life. Even though it’s early days, all of this means that brands and advertisers should keep up-to-date on the latest news in VR; few dispute that in time it will become a critical market. Here are the things that you should know about VR now. 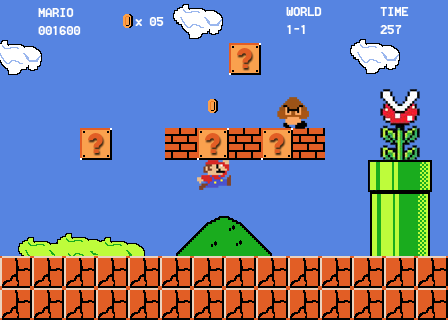 Game developers have a long tradition of driving new content to create more immersive and realistic worlds. Their drive to continually improve their products, coupled with technological advances, will inevitably lead to the creation of photorealistic VR gaming worlds that are likely to be indistinguishable from reality. 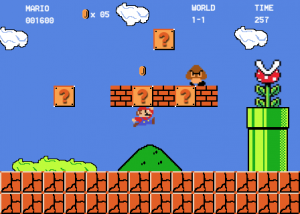 Think how far we’ve come in 33 years since the 8-bit Super Mario Bros first bounced their way across CRT TVs – and how much those early pioneers did to propel adoption of ‘cutting edge’ content. The games industry is set to repeat this quality gaming entertainment delivered by a mature gaming industry driving a projected $5.1bn in game-related VR sales this year. While the gaming industry might be on the leading edge in terms of consumer adoption of VR as entertainment, it’s important to note that other brands are getting in on it in interesting ways as well that might not generate as much revenue (at least not yet). Brands that are exploring ‘low impact’ ways to use VR include McDonald’s, which created Happy Meal boxes that can be refolded into a mobile VR headset for engagement with a skiing game or Coca Cola, which did something similar with its boxes. While you might want to dismiss these forays into VR as gimmicky, surely both strategies created buzz and delighted customers, building loyalty. Then there are high-end clothing retailers that are leveraging VR to expand the reach of their fashion shows. Fashion brands Dior and TopShop provided their fans with virtual front row seats to exclusive shows using virtual reality displays. TopShop launched into VR back in 2014 with the launch of ‘The Catwalk Experience’, which delivered an immersive livestream show through Oculus Rift hardware at TopShop’s premier store in Oxford Street in London. Last year, Dior followed suit as it launched ‘Dior Eyes’ which empowered fashionista consumers access to immersive backstage footage/content from the brand’s numerous fashion shows when they visited Dior stores. Then Merrell, the hiking boot company, designed an Oculus Rift VR experience that had people ‘squealing in delight…with their knees trembling’ – reinforcing the brand’s adventurous image. Within the automobile industry, the American company Cadillac is exploring how it can leverage VR to sell more cars. The Wall Street Journal reported that Cadillac is working on a plan to replace some of its existing physical showrooms with virtual ones. Whilst their cars are being serviced, customers will learn about newer Cadillacs via VR headsets; the showrooms will have very little inventory on-hand. There are other interesting ways in which brands are already using VR that touch on marketing but aren’t as customer-facing. For example, Happy Family, a baby food brand, experimented with using VR to test merchandising of products in order to shore up gut feeling with hard data. (It’s worth noting that the VR approach cost the company less than traditional methods of testing merchandising). Similarly, before long we can expect brands to experiment with reverse product placement – they’ll be able to test the appeal of new products in VR before launching full production. Eye tracking tech is gearing up to be a game changer for the advertising world. It empowers marketers to measure engagement with ads and brand exposure right down to the microsecond. Many of the major tech players like Google and Samsung are heavily investing in this tech because it measures eye activity, determining a person’s gazing location on a digital screen, their frequency of blinking and pupil reaction to different stimuli. 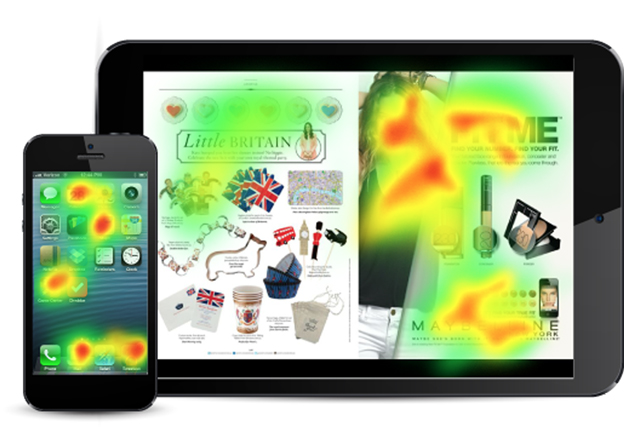 Within the context of advertising, eye tracking technology measures consumer attention in a whole new way. It can determine, for example, where exactly consumers focus within an ad, and for how long. Data like this will soon be invaluable for gaining insights for e-commerce/m-commerce websites/apps and analyses of consumer behaviour, and the integration of eye tracking tech in the latest VR and AR tech is expected to increase the growth of both industries, making both advertising and user interfaces more effective. Leading sports broadcasters are exploring ways to offer audiences fully immersive VR experiences, placing sports fans right in the middle of the action, whether watching from a stadium seat, or seeing the action unfold from a player’s point-of-view. Last summer both the BBC and NBC delivered quality on-demand VR Olympics content through VR apps on iOS and Android. The BBC’s offering, ‘BBC Sport 360’, covered the opening ceremony in Rio and delivered 360-degree presentations of Olympic sports including volleyball, boxing, gymnastics, plus the closing ceremony. The world of motorsports has also embraced VR. This year Ford created a platform of immersive branded VR content which took a slightly different approach to the obvious VR camera in a car routine, so the company opted to create narrative led VR content which lets consumers immerse themselves in stories related to Ford – see a trailer for its Le Mans 2016 VR/360 experience here. 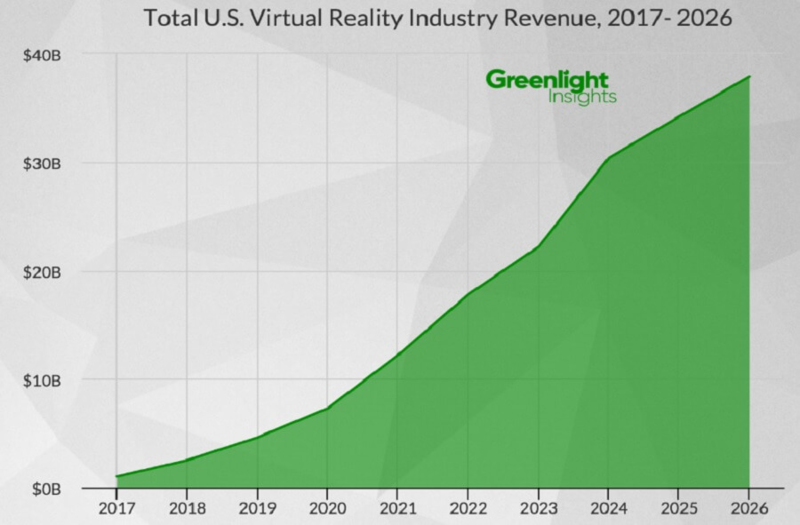 The latest growth forecast has VR increasing to $38bn in revenue over the next decade, with explosive growth by 2026, as reported by Greenlight Insights. Clifton Dawson, CEO of Greenlight Insights, believes that the release of VR devices from tech leaders is significant, but it’s more the broad-sweeping advances in the industry as a whole that will propel the industry forward. “A clear shift from tethered to standalone head-mounted displays (HMDs), a timeline for 5G across several global markets, and the viability of VR for non-entertainment will fuel the market beyond 2020,” he noted. Whilst the Greenlight Insights prediction of $38bn by 2020, another report by Citi sees the VR market becoming a trillion dollar industry by 2035. VR can drastically raise the levels of engagement and awareness for branded content because it’s immersive, memorable, and novel (for now!) compared to other technologies. VR immeasurably increases the ability for marketers to captivate audiences, adding more depth, emotion and interactivity to the storytelling process. VR isn’t just a niche of console or PC gaming; it represents a quantum leap in digital communications and experiences afforded by technology, heralding an uncharted era in marketing. Coupled with eye-tracking technology, it has the potential to take performance-based marketing to whole new realms. In VR, agencies, media owners and content creators are spearheading the way forward with ground-breaking experiences which have the potential to be transformative and energising for target audiences.